Sunshine and a few afternoon clouds. High 62F. Winds NNW at 5 to 10 mph.. The Wilks brothers' N Bar Ranch is headquartered along Flatwillow Creek in Fergus County. The Big Snowy Mountains, the water source for Flatwillow Creek, can be seen in the background. Deer graze on the N Bar Ranch, owned by Dan and Farris Wilks. The elk population near the Little and Big Snowy mountains has grown to more than 900 percent above state Fish, Wildlife & Parks' objectives for the herd. Elk trot across a pasture on the N Bar Ranch with the Big Snowy Mountains rising in the distance. Farris Wilks, along with his brother Dan, are the second largest landowners in Montana. Four Montana ranches acquired by billionaire Texas brothers Dan and Farris Wilks are being sold by their own real estate company. Wilks Ranch Brokers, based in Cisco, Texas, is advertising two ranches in Fergus County as well as one in Musselshell and Rosebud counties. Added together the lands total more than 38,700 acres with an asking price north of $43.8 million. The ranches were all purchased within the past four to six years. The real estate website identifies the company as specializing “in the offering of quality ranches, mountain timberland, agricultural, hunting, and recreational lands across the United States. With a combined 20-plus years of experience in real estate and land management, Wilks Ranch Brokers LLC is dedicated to offering properties of the highest standards.” Jimmy Williams is listed as the broker for the company. He could not be reached for comment on this story. With almost 346,000 acres, the Wilkses rank second in landownership in Montana. Only the logging company Weyerhaeuser/Plum Creek Timber owns more land in the state. The Wilkses began buying land in Montana around 2012 after selling their oil fracking business a year earlier for a reported $3.2 billion. One of their first purchases in the state was the N Bar, a historic ranch in central Montana that has passed through the hands of a few wealthy owners. In the first two years of their land buying spree in Montana, the Wilks brothers acquired about 177,000 acres. Then they expanded out from the core area around the N Bar, picking up lands across the state and the West. The 2017 Land Report estimated the Wilkses’ holdings at 672,000 acres in five states, large enough to rank them No. 11 on its list of largest landowners in the United States. That number was up by 172,000 acres from the year before, based on purchases of Idaho timberland from Southern Pine Plantations. Within a year the brothers were advertising 54,000 acres of the Idaho land for sale in six different parcels, according to an Idaho Statesman article. Now the Wilkses are splitting off other acquisitions for sale. 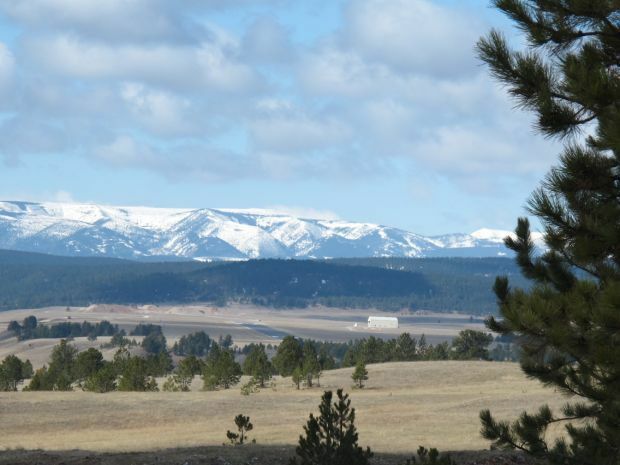 A 5,710-acre parcel in the Little Snowy Mountains south of Lewistown for $12,250,000. A 10,206-acre ranch along Sage Creek near Denton for $8,998,000. 13,107 acres south of Musselshell in the Bull Mountains for $14,750,000. 9,680 acres south of Colstrip for $7,854,000. The Wilkses have gained notoriety in Montana not only for being one of the largest private landowners in the state, but also for having the largest elk herd on their land — property that includes the combined acreage of the N Bar and Pronghorn ranches southeast of Lewistown along the Little Snowy and Big Snowy mountains. The elk herd is estimated at around 2,600 animals in Hunting District 411, north of the Little Snowies, and 4,800 in HD 530 south of the mountains. A 2,700-acre Bureau of Land Management inholding on the N Bar property, known as the Durfee Hills, was at the center of a brouhaha with Lewistown-area hunters four years ago. The Wilkses attempted to purchase the land from the BLM through a land exchange that was shot down following public protests. Even though the Durfee Hills is only accessible by airplane or helicopter, many hunters denounced any attempt by the BLM to swap the acreage because of its access to the large and growing elk herd. After the land swap fell apart the Wilkses were fined and had to rebuild a portion of a fence they had built around the Durfee Hills that intruded onto BLM property and resulted in the illegal removal of some timber. Public access advocates denounced the fencing as a deliberate attempt to keep elk on the N Bar Ranch while also frustrating hunters attempting to fly into the property. Strong elk populations are a selling point for the Wilkses’ land in the Bull Mountains. The real estate website boasts the ranch is home to more than 700 elk. Such captive elk herds on private lands have been a thorn in the side of the Montana Department of Fish, Wildlife and Parks, which is required by legislators to maintain populations of big game at socially acceptable levels. The problem is that the main way FWP has to control those wildlife numbers is through public hunting. Without access to the land where animals seek refuge from public hunters, however, the agency has been frustrated in bringing big game populations within its own objectives in several areas — including the Wilkses’ large holdings in Fergus, Musselshell and Golden Valley and counties. Although the Wilkses may be selling some of the extraneous purchases they've made during the past four years, they're still holding onto the N Bar. Under the the brothers’ ownership that property now boasts a 6,000-foot-long airport-quality landing strip overlooked by two lodges. Adjoining land acquisition has expanded the N Bar to about 200,000 contiguous acres. On the ranch the Wilkses are raising registered and commercial black Angus cattle, one of six such ranching operations the brothers own that include outfits in Idaho, Oregon and Texas. The brothers also raise captive whitetail deer in Texas at their Wilks Whitetail ranch in Cisco. The ranch also sells deer hunts as well as hunts for such exotic African wildlife such as gemsbok, kudu and wildebeest. Montana does not allow captive wildlife breeding, which has been linked to the spread of chronic wasting disease — a fatal neurological disease that affects deer, elk, moose and caribou. Although selling a ranch purchased only a few years earlier may not sound like a money-making move, that’s not necessarily true. “The ranch market is strong,” said Dave Johnson, a partner in Hall & Hall real estate, in Bozeman. The long-term average rate of appreciation has been about 6.1 percent during the past 10 years, but it’s also uneven, he noted. Ten years ago the United States was in the depth of a recession, so in some cases prices may have gained as much as 20 percent in just a few years. Johnson said sales in Montana in 2018 were double what they were in the previous two years, both in the number of transactions and the amount of those land deals. While in 2016 and 2017 large ranch sales totaling more than $10 million totaled four, Johnson said there were 10 to 12 in 2018 alone. Those sales were a mixture of working cattle ranches and those bought for their recreational amenities. The 10,000-acre Lazy TP Ranch, along the Jefferson River south of Whitehall, sold last year. It was advertised for $24.5 million. The Montana Department of Natural Resources and Conservation spent $11.3 million on Angela Farms, a nearly 17,000-acre farm north of Miles City. The Spear Lazy U Ranch near Wilsall sold in 2018. Its more than 6,300 acres were advertised for $15.25 million. Next door the Lazy SR Ranch’s 7,000 acres were advertised for sale for $18.5 million. Topping them all, though, was the sale of the LF Ranch near Augusta along the Rocky Mountain Front. The 42,215-acre ranch was advertised for $52.5 million. While high-dollar sales increased, Johnson said the smaller ranches — over 200 acres — were slower to move as asking prices seemed to outpace buyers’ willingness to plunk down cash. Out of about 600 listings in that category, he said only about one-quarter of them sold or were removed from the market. It is sad that these rich (you know what I tried to say below) come into our state and pay 4-5 times the amount ranch land is worth, just to have their own private playground for themselves and their billionaire friends. In doing so, they exclude Montanans from areas we used to be able to hunt, fish, hike, and camp on. Now, the Wilkes boys are trying to sell these huge combined ranches--- and the only people that can afford their $1,110 per acre asking price are other billionaires. No real rancher could ever even hope to make a ranching operation pay at these prices. At 75 I am glad to have had the privilege of growing up in this "Last Best Place," but sad that it will not be that way for upcoming generations of Montanans, thanks to the likes of the Wilks boys, Turner, Siebel and too many other billionaires too numerous to count. Then, we have guys like Daines, Gianforte , and Rosendale who want to stealthily privatize our public lands Why any true Montanan would want to put these types in office is hard for me to imagine. The land is worth what someone will pay for it. They are large contiguous properties in desirable areas. It's also their property so they can exclude or invite whoever they want. It sounds like you're just against the private ownership of property at a certain point, Bob. How big is too big and how small too small? Who gets to decide how much property a person is allowed to hold? I know you probably don't see this, but them putting the work in and wanting to sell the different pieces of land altogether is actually a good thing. Time for land trusts to get involved. You do donate and support local land trusts right? They're out fighting for what you say you believe in. Oh, but I guess they're out "stealthily privatizing" the land since they're incorporated. I get the point you're trying to make about the State changing, but you should do more thinking on this. It's over divided small to medium sized developments that are drastically changing the landscape, not supersized contiguous lands like this. These are exactly the types of lands that land trusts and other interests look for. The billionaires that are buying up Montana also are able to use these properties to dodge huge amounts of taxes, so, in a sense, taxpayers subsidize their purchases. These purchases drive land prices so exorbitantly high that that farmers and ranchers could never hope to buy and make a living on that land. To your point about land trusts, all I can say is that these obscenely wealthy people also make it extremely costly for these trusts to acquire more land. The end result is that this "Last Best Place" is rapidly becoming the exclusive playground for 0.1% of our population. Voting in people like Daines and Gianforte only serve to accelerate the pace of that deterioration.